Azure IP Advantage applies to the software running IoT devices connected to Azure. We also offer uncapped indemnification for Azure Sphere and Windows 10 IoT, and the ability to pick from 10,000 Microsoft patents to protect against lawsuits aimed at your own IoT software. Build on Azure knowing that you have best-in-industry uncapped defense and indemnification coverage. This extends to open-source technology that powers Azure services, such as Apache Hadoop® used for Azure HDInsight. You don’t have to do or pay anything extra—coverage is available if you need it. Defend against patent lawsuits targeting your innovation with access to a large patent portfolio. You become eligible for this benefit simply by using Azure regularly. If sued, eligible Azure customers can acquire one of 10,000 patents that Microsoft makes available to help counter assert against an aggressor. To learn more about how to pick a patent, read the FAQs. We’re pledging to Azure customers that if we transfer patents to non-practicing entities (NPEs), those patents can’t be asserted against them. Non-practicing entities primarily use patents to generate revenue. While Microsoft doesn’t have a general practice of transferring our patents to NPEs, if it were to occur, a springing license is available to all eligible Azure customers. Digital transformation is accelerating, affecting every industry across the globe. Delivering software-based products and services in the cloud creates new business risks, including the possibility of increased IP infringement. Azure IP Advantage fosters a community and business environment that values and helps protect innovation in the cloud. Free LOT Network membership, which prevents NPEs from asserting patents covered by the LOT license against network members. LOT members can still sell their patents and take legal action against other members. Startups can join LOT for free. Up to three free Microsoft patents in technical areas such as artificial intelligence, multimedia, and security to help boost their own IP portfolio. What is Microsoft Azure IP Advantage? 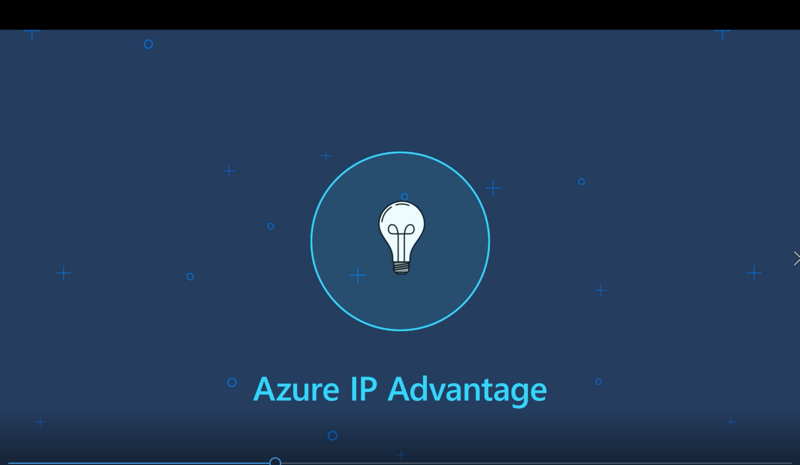 Azure IP Advantage is a program for Azure customers that offers best-in-industry protection against intellectual property (IP) risks. By participating in this program, developers can focus on coding, while you focus on running your business with reduced risk and exposure to IP lawsuits without diminishing your own IP rights. Eligibility requirements may apply. For benefits specific to startups, see Startup benefits. Why does Microsoft offer this program? We’re working to foster a business environment that values and protects innovation, so that your company and developers are free to focus on building transformative technologies. Why do I need Azure IP Advantage? New IP risks emerge as businesses use the cloud to transform and bring more IoT devices online. If you run services in the cloud or are increasing the number of your connected devices, consider your strategy for addressing IP infringement risk. Choose a cloud platform partner who understands these risks and has a comprehensive plan to help you address them. All Azure customers are eligible to participate in Azure IP Advantage. However, the patent pick and springing license benefits are subject to the eligibility criteria that are described in the Microsoft Azure IP Advantage terms and conditions. The benefits for startups are available through the License on Transfer (LOT) Network. Do I need to sign up for or enroll in Azure IP Advantage to receive the benefits? No. Azure IP Advantage is a feature of the Azure platform. No sign-up or enrollment process is necessary for the indemnification that’s included in our standard customer terms for Azure, Azure Sphere, and Windows 10 IoT software offerings. Nor is sign-up or enrollment required for the springing license and patent pick options if you meet the eligibility requirements that are outlined in the Microsoft Azure IP Advantage terms and conditions. Azure startups that join the LOT Network must agree to the network’s reciprocal springing license commitment and then may choose to receive up to three Microsoft patents through the network. See the Startup benefits section for details. Where can I find more information about Azure IP Advantage? Visit Azure IP Advantage for more information. If you have questions, email IPAdvant@microsoft.com. Indemnification is a contractual obligation that the supplier of a product or a service might provide to protect customers from IP infringement claims that are asserted against them for using the supplier’s product or service. In the context of Azure IP Advantage, our indemnification terms protect you from IP infringement claims that arise from your use of Azure platform technologies and their open source components. For IoT scenarios, indemnification terms are applied to your use of Azure Sphere and Windows 10 IoT on IoT devices. Doesn’t Microsoft already provide uncapped indemnification for its products and services? Yes. For many years, we’ve had a practice to indemnify and defend our customers for IP risks as described in our contract terms. With Azure IP Advantage, we also defend IP claims against open source code that’s included in these product and services. What do you mean when you say that “open source is indemnified by Microsoft”? We indemnify open source software that we incorporate into Azure and provide under our terms. For example, Azure HDInsight—our Hadoop offering—is covered by indemnification. 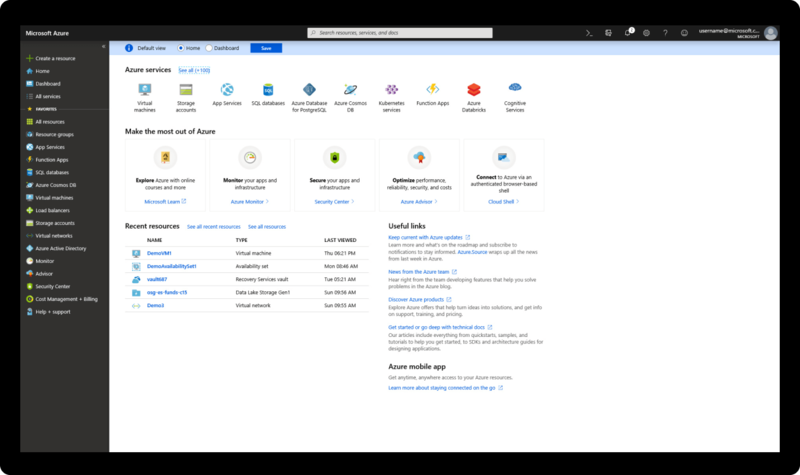 The Linux-based operating system for Azure Sphere is also covered. Open source that’s provided under a separate license, such as a Linux distribution in a VM, isn’t covered by our terms but might receive indemnification under another provider’s terms. In China, Microsoft Azure Operated by 21Vianet— an independent entity that the Chinese government licenses to provide cloud services under Chinese law—provides indemnification. Does indemnification have any exclusions? Our indemnity obligation doesn’t extend to your own data, non-Microsoft products, or any modifications you may make to Microsoft software or online services. It also doesn’t cover any customer use that violates the law or damages a third party. Consult the terms of your Microsoft license agreements for details. Where can I find the provisions for indemnification? The indemnification terms for Microsoft Azure are in the applicable license agreement. For example, the Microsoft Online Subscription Agreement has the terms in the agreement. The terms for the Microsoft Enterprise Agreement are in the Master Business and Services Agreement. A license under the Open Programs, a Microsoft Cloud Agreement (the customer agreement for Cloud Services Providers), or the Enrollment for Education Solutions each contain the corresponding indemnity language. These agreements incorporate the Microsoft Online Service Terms, which were updated on February 1, 2017, to include coverage for open source. If you are in China, see the indemnification provisions in the customer agreements that Microsoft Azure Operated by 21Vianet provides. For more information, see the Azure Sphere and Windows 10 IoT license agreements. What is the purpose of the patent pick? The patent pick deters operating companies from suing Azure customers for patent infringement on their workloads that run in Azure or their software that runs on IoT devices that are connected to Azure. The Azure IP Advantage patent list gives these customers access to a portfolio of patents that they can use for defensive purposes in the context of a lawsuit. How does Microsoft choose the patents to include in the patent pick? We engaged in a lengthy and careful process to select a portfolio that represented a broad cross-section of technologies within our overall portfolio, weighted toward cloud technologies. Independent patent experts reviewed this diverse portfolio to ensure it provides value to our Azure customers. Can Microsoft remove patents from the list? Yes. We own the patents in the list until they are transferred to a customer as part of Azure IP Advantage. Patents in the list may expire, be transferred to third parties, or be included in our patent licensing programs. We plan to add new patents and update the list from time to time in order to maintain a total list of 10,000 patents. How many patents does Microsoft own? As of March 27, 2019, we have over 60,000 patents worldwide. How many patents are available in the patent pick? We have 10,000 patents available in the patent pick. See the Azure IP Advantage patent list for the available issued patents and pending applications. We may modify this list as changes or updates occur. Do the 10,000 patents include patents from other countries in addition to the United States? Yes. They include patents from the United States and several other countries. The list also includes pending applications that are ancillary to issued patents in the same patent family. How do I know which patent to select? Although we can’t provide advice on which patent to select, we recommend you consider engaging legal counsel or IP experts for advisement. For a list of IP advisors, see High Tech Solutions and TechInsights. If multiple companies want the same patent from the patent pick list, which company gets priority? Patents are assigned to the first qualified customer who meets the conditions for a patent transfer and completes the necessary documents to take title to the patent. For details, see the Microsoft Azure IP Advantage terms and conditions. Can I benefit from the Azure IP Advantage patent pick if I have workloads running in a hybrid Azure environment? Yes. You must meet the usage requirements for Azure software or services and the other program requirements. Is the patent pick for IoT devices available only if the IoT device is running Windows 10 IoT or Azure Sphere? No. The patent pick is available if patent litigation occurs against software that’s running on an IoT device connected to Azure, even if the IoT device is running a non-Microsoft operating system. You may use the patent to counter-assert in a lawsuit for defensive purposes only. Furthermore, you may not use the patent against an Azure workload. Please consult the Microsoft Azure IP Advantage terms and conditions for more details. Are the patents that I choose from the patent pick list subject to Microsoft encumbrances on those patents? Yes. All patents are subject to any existing encumbrances. Can I use the patent pick for an infringement lawsuit that was filed before Azure IP Advantage was launched? No. The patent pick applies only to lawsuits that were filed after the effective date of Azure IP Advantage, which is February 8, 2017. In China, the patent pick applies to patent infringement lawsuits that were filed after October 1, 2017. Can I use any patent that I choose as part of the patent pick to assert action against other companies after I use it for patent defense? Can I exercise the patent pick to defend against a lawsuit for which I’m already indemnified by Microsoft or a third party? No. The patent pick helps defend you against lawsuits for which you don’t already receive indemnification. How much does Microsoft charge customers for patent sales as part of the patent pick? We transfer patents that are selected through the patent pick benefit for a fee that covers the approximate administrative costs that are associated with the transfer—not the market value, which could be much higher. We don’t profit from these patent transfers. Do I own the patent after Microsoft transfers the patent to my company under the terms of the patent pick? Yes. After the patent is transferred to your company, you own the patent. What are the requirements to be eligible for the patent pick? You paid at least USD1,000 per month over the past three months for Azure usage. You remained patent peaceful (no legal action) against Azure workloads in the last two years. Your Azure workload or the software on your IoT device that’s connected to Azure was sued for patent infringement. For more details, refer to the Microsoft Azure IP Advantage terms and conditions. How can I determine whether I meet usage requirements, as defined in the program’s terms and conditions? If you’re a Web Direct (Microsoft Online Subscription Program (MOSP)) customer, download the usage details for your subscription from the Azure account center. If you’re an Enterprise Agreement customer, review the usage summary in the Reports section of the Azure Enterprise Agreement portal. If you buy services through a cloud services provider, review your reseller invoices. Does prepayment for Azure services through an Azure monetary commitment count toward eligibility for Azure IP Advantage? No. Eligibility is based on Azure usage, regardless of whether it’s paid in advance or the account is in arrears. Can I average the USD1,000 monthly eligibility requirement over the past three months, for example, if I use USD800 in one month, USD900 in the second month, and USD1,500 in the third month? No. You must use at least USD1,000 of Azure services for each of the last three months to qualify for the patent pick. Can I aggregate usage across several of my Azure subscriptions to meet the USD1,000 eligibility requirement? Yes. This usage includes your Azure subscriptions in China that Microsoft Azure Operated by 21Vianet manages. What is the benefit of a springing license? A springing license is a benefit that comes into being (“springs” into existence) when a defined event occurs. For Azure IP Advantage, eligible customers become fully licensed to one or more Microsoft patents when we transfer such patents to nonpracticing entities (NPEs). For additional protection, customers can also purchase a LOT Network membership. How does the springing license benefit compare to the LOT Network? The LOT Network is multiparty agreement where individual companies elect to provide springing licenses to other companies within the network in exchange for a reciprocal commitment to provide a springing license. We provide the unilateral springing license to you as part of Azure IP Advantage and don’t require a reciprocal promise in return. What are the requirements to be eligible for the springing license? Any bona fide Azure customer is eligible if you’ve paid at least USD1,000 per month over the past three months for your usage of Azure. For more details, see the Microsoft Azure IP Advantage terms and conditions. Do startups get additional benefits as part of the Azure IP Advantage program? If a LOT member transfers a patent to an NPE, an automatic free license to that patent is provided to all LOT members. Qualified Azure startups that join the LOT Network may receive up to three free Microsoft patents through LOT in technical areas such as artificial intelligence, multimedia, and security. What is a qualified startup? It meets the LOT Network’s criteria for startups. Its Azure consumption is greater than USD1000 per month for the past three months. For more details, see the Patent Transfer Program FAQs on the LOT Network site. Is Microsoft a member of the LOT Network? Yes. Microsoft joined the LOT Network in October 2018. Is my membership with the LOT Network automatic through Azure IP Advantage? No. To take advantage of the benefits for startups, you must join the LOT Network. How do I discover which Microsoft patents are available to qualified startups? Please see the LOT Network for more details about their patent program. How many Microsoft patents can I get? Qualified startup companies that join the LOT Network and meet its eligibility requirements may select up to three Microsoft patents. What are the restrictions for using the Microsoft patents for my startup? Microsoft makes patents available to startups through the LOT Network. To obtain these patents, if you are a qualified Azure startup, first join the LOT Network. The Microsoft patents that you acquire are subject to LOT Network encumbrances, including the reciprocal springing license that all LOT members provide to all other LOT members. Because these patents were originally Microsoft patents, they are also subject to Microsoft encumbrances. Otherwise, you are not restricted on how you use these patents. Is Azure IP Advantage available to customers everywhere Microsoft does business? Azure IP Advantage is available in every market where Azure cloud services, Azure Sphere, or Windows 10 IoT is available. In most countries, Azure services and Azure IP Advantage are available directly from Microsoft. In China, the indemnification benefits are available from Microsoft Azure Operated by 21Vianet, while the patent pick and springing license are available from Microsoft. For a list of countries where Azure Sphere is available, see Azure Sphere pricing. Is Azure IP Advantage available for Azure Stack? Yes. For example, the patent pick is available to counter a patent lawsuit that’s asserted against your workload running in Azure operated by Microsoft or in Azure Stack in your own environment or hosted by a reseller. How long will Azure IP Advantage be available? We intend to offer Azure IP Advantage indefinitely. Every customer receives IP indemnification, even if that customer isn’t eligible for other aspects of Azure IP Advantage. We may adjust other parts of Azure IP Advantage to meet evolving business needs. Can I participate in Azure IP Advantage if I use my Azure subscription to deliver a solution or managed service to my own customers? Yes. Your own usage must meet the subscription payment threshold and other requirements as defined in the Microsoft Azure IP Advantage terms and conditions. If I’m a Microsoft customer but don’t use Azure, which benefits can I access? The defense and indemnity benefits that are part of Azure IP Advantage are also part of the standard terms for Microsoft online service offerings. The patent pick and springing license benefits, however, are currently available only to eligible Azure customers. Can I benefit from Azure IP Advantage if I am a Microsoft Partner? Yes. However, you must meet the Azure subscription payment threshold and other requirements as defined in the Microsoft Azure IP Advantage terms and conditions. Your eligibility is determined by your own Azure usage, not your customers’ usage. How can I get IP insurance for my business to complement the protection that’s provided by Azure IP Advantage? Azure IP Advantage helps protect your innovation in Azure on a public or private cloud (Azure Stack). You might also want to get insurance for your patent risks. For patent pick eligibility: You must (i) have an Azure usage of $1000 per month over the past three months; (ii) have not filed a patent infringement lawsuit against another Azure customer for its Azure workloads in the last two years; and (iii) show evidence of a current patent litigation that occurred after February 8, 2017. Legal transactional costs apply. For springing license eligibility: You must have an Azure usage of $1000 per month over the past three months. For startup benefits: Qualified startups are those who meet the LOT Network criteria for startups and have an Azure consumption greater than $1000 per month for the past three months. See the Azure IP Advantage terms and conditions and Azure IP Advantage patent list. Additional terms apply. Contact us to request detailed program terms and conditions. Ready when you are—let's set up your Azure free account.